The Winter Jam Tour Spectacular, Christian music’s largest annual tour and one of the top first quarter tours in the world has announced a history-making tour first while presenting a 44-city schedule as part of its 2019 tour. 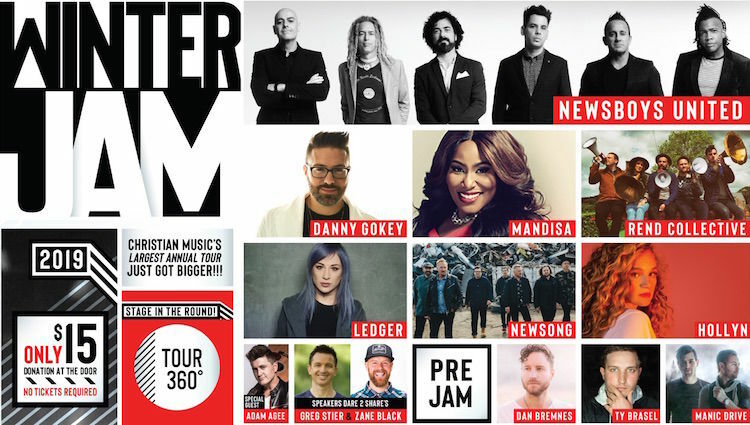 For the first time, Winter Jam will be presented on a 360º “in the round” center stage, showcasing a diverse lineup helmed by supergroup Newsboys United. Newsboys United and the “in the round” center stage will visit Bankers Life Fieldhouse in Indianapolis on Friday, March 29 as part of the show’s final weekend. The tour begins January 11 in Jacksonville and winds through nearly four dozen cities before landing in Indy. The tour concludes March 31 in Cleveland. Admission donations of $15 are accepted upon entry to the show.